Our Locksmith shop in Haringey offers a first class Locksmith Service. 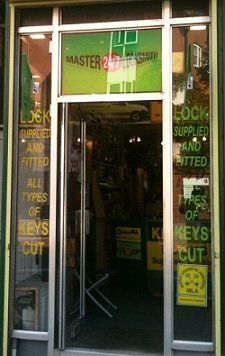 A Locksmith shop in Green Lanes, Haringey, which covers all your Home and Commercial needs. For copying keys, repairing locks and selling all types of locks. We give the old form of service, by repairing locks, where possible. From our Locksmith shop in Haringey we offer all forms of Locksmith work, from copying standard keys to a complete master suite. We offer registered section keys for your security needs and make keys to most type of locks, by hand where required. We stock and sell every make of lock, if we do not stock it we will make sure we will find it for you. WE OFFER TRADE DISCOUNTS WITHIN THE BUILDING OR PROPERTY COMPANY DIVISIONS. WE OFFER AN IN-HOUSE PASSING AND MASTERING SERVICE FOR PROPERTY COMPANIES. ESTATE AGENTS AND HOUSING DEPARTMENTS. North London Locksmiths Ltd. has been established at 79 Grand Parade, Green Lanes, Haringey, London N4 1DX for more than 30 plus years and as you can imagine have built up a large stock of old and new parts of locks. We can undertake copying of Transponder Keys. Our experienced Team at our Traditional Locksmith shop in Green Lanes, Haringey, N4 1DX will always advice you on any lock problem you may have. We will also try to repair locks, before selling you a new one....... Doesn't it make sense to use a Company who has a home base, for all your HOME SECURITY needs? From our shop in North London we cover all aspects of the Locksmith Shop Services, from standard key cutting to a full Master Suite. North London Locksmiths Ltd. offer a Locksmith Service, to cover all of the Locksmith trade, we will always try and help you find what you want. For the Number "ONE" Locksmith Shop Service.